The most remarkable aspect of the Remington Standard 2 typewriter, the first typewriter to be produced and sold in considerable numbers, is the fact that it looks so familiar to modern eyes. 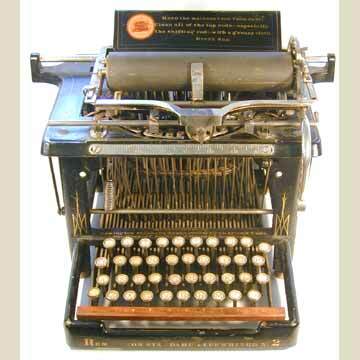 This is the archetype of the typewriter. Ask anyone to pick out the oldest machine in any typewriter collection that includes this model from 1878, and they'll more than likely pick out a machine that was built 20 years later. The Remington 2 (the name Remington 1 was used for the latest Sholes & Glidden model) was fitted with a number of improvements to the original S&G design that would last a century. The qwerty keyboard had been designed by Sholes himself, but new to the keyboard was the 'shift' key, that literally shifted the carriage to the front in order to type capitals. And a 'shift' key is what we still call it on our computer keyboards today. The Remington 2 was an upstrike machine, with the type hanging down in a circle in the type basket (pict. 4). On hitting a key, the type would swing up against the platen and leave an impression of the letter on the paper. The typist would have to lift the carriage to see what was written. Remington produced several other models that were closely related to the nr 2, until the Remington 6 (1894) became the most popular of all Remington models. A considerable number of Remington 2s were produced. In 1891, when the Remington 4 (caps only) and 5 (introduced in 1886) were the only models available, Remington claimed in a brochure that more than 100,000 Remington typewriters were in use, plus 40,000 machines of alle other brands combined. It is unclear if this claim is exact, but it is probably not too far from the truth. The Remington 2 was being offered for sale well into the 1890s. And it wasn't until 1908 that Remington yielded to market pressure to produce a frontstrike machine, the Remington 10. When the first 1000 Sholes & Glidden typewriters were produced at the Remington factory, Densmore and Sholes were the primary owners of the machine. Remington and sons had only a minority interest. For a brief period between 1877 and 1882 Remington had a majority share, but both engineers (Yost) and marketeers (Wyckoff, Seamans and Benedict) who got involved obtained shares. Wyckoff, Seamans and Benedict in New York obtained sole distribution rights for the Remington typewriter in 1883 and three years later also obtained sole manufacturing rights, which included the right to use the Remington name on the machine that had now nothing to do anymore with the original Remington factory and family. In fact, they built their own factory for the production of Remington typewriters.